One of the "crafts of Lora's past" is cross stitch. I know I've put together a few little samplers and such and they took a lot of time. When I'm looking for a unique cross stitch pattern (including Dr. Who's Tardis... WHAT?! ), I head over to Stitch Me Gifts. They have a super cute Lion this month and you can get the chart for a very reasonable price. If I started listing all the patterns I liked on the site, we'd be here all day and you'd never get to see them... so... go... look! This post is old. For the latest information about the Patch Programs offered by BCG Patches, please "like" our Facebook page, join our Newsletter mailing list, and visit our website. 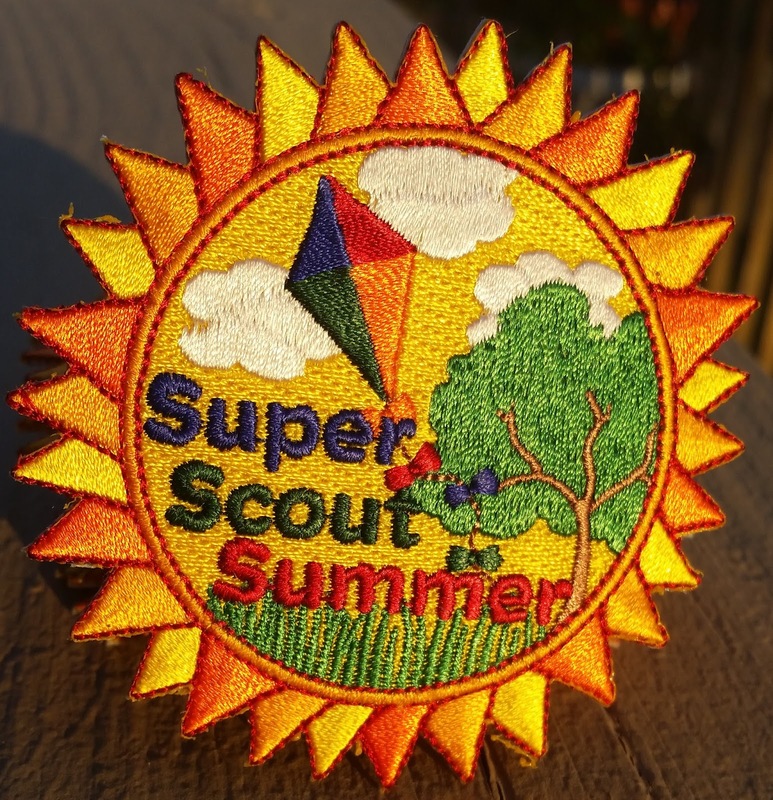 This patch program was inspired by one of my favorite qualities of scouting, Service Projects. You can call it Take Action Projects, Service Projects, Volunteering, or Giving Back. No matter what you may call them, they are simply activities where you are volunteering your time to make the world a better place. That's a pretty cool thing in my book. The focus of this patch program is to encourage you to find ways to be a pair of Helping Hands. There are a variety of people, places, and things listed for ways to lend a helping hand. You can come up with your own idea, too. Let me tell about the idea behind the design. The world is in the shape of a heart, because your heart has to be behind your work in order to change the world. The Earth heart is held with a pair of strong hands wearing work gloves and a denim shirt. My Dad, who passed away last Summer, always wore denim shirts when he worked. He told me how proud he was of me for the volunteer work I do. I grew up seeing him helping others anytime he could, so I learned from the best. The hands are holding forget-me-not flowers, because we can never forget to help out and plant seeds of kindness each day through the service we give. So, this patch is very special to me. It's a tribute to my Dad, to my own volunteerism, and knowing someone out there sees and recognizes the amount of time and work we put into making the world a bit better. 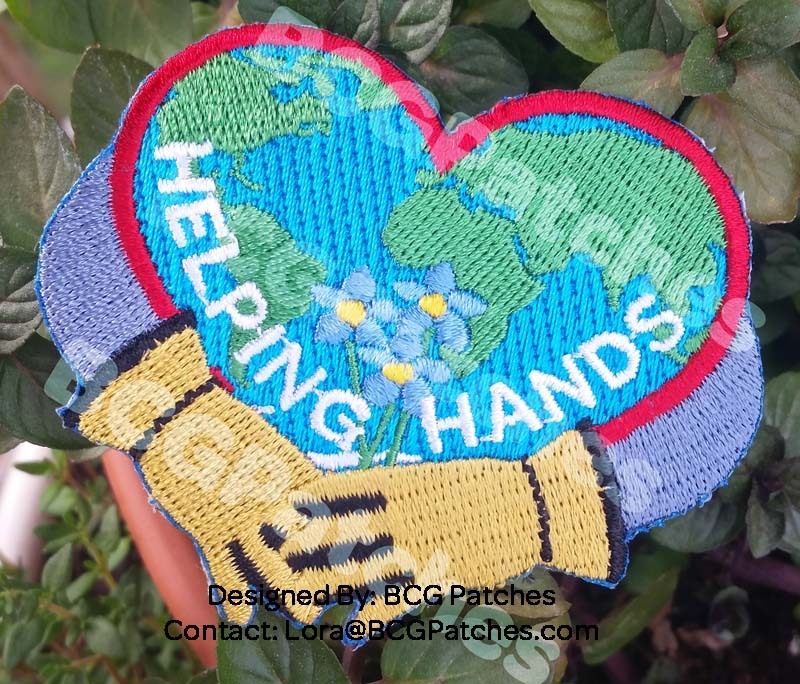 The Helping Hands patch is approximately 2 1/2" x 2 1/4". 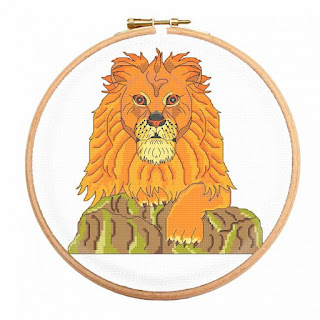 It is fully embroidered and sew on. Patches are $2.00 each, which includes shipping and applicable taxes. The Program Guide is a free download. 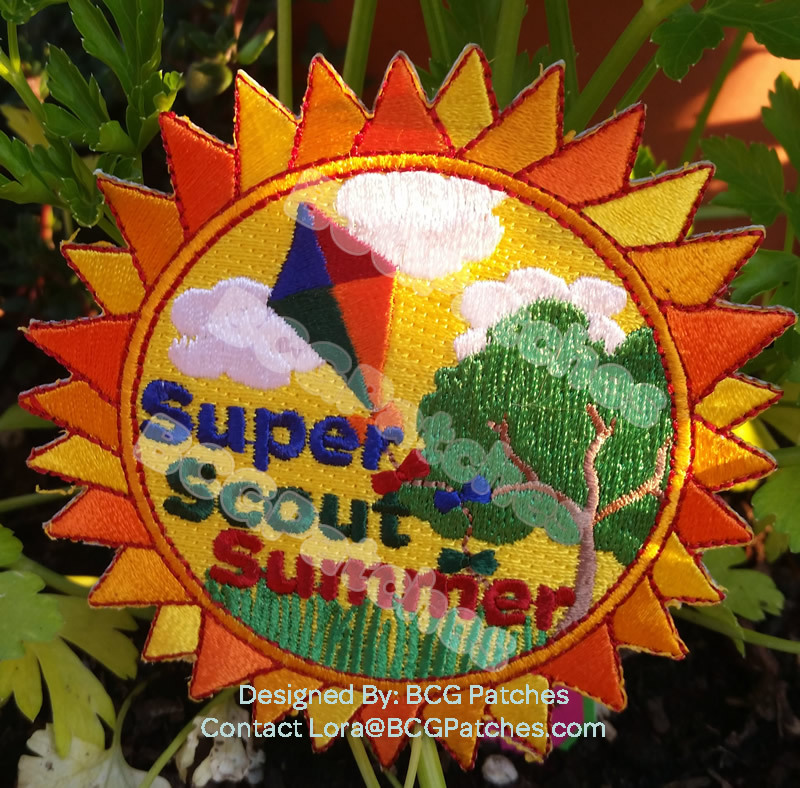 Exciting times at BCG Patches! I launched the first Patch Program a few weeks ago... wow, looking at the date, it's been 4 weeks ago now. In the beginning I had ordered what I thought was plenty of patches and did pre-orders. The Pre-orders did well and sold about half of the initial order. Then, the patches arrived. I shared photos of the actual patch. I personally think it was the photo of the patch in the sunlight that caught attention. This patch just shimmers in the sunlight. The stitching is gorgeous!! So, the patches arrive. I post a few little photos and it sold out in 5 hours. We're talking about over 600 patches in less than 5 hours. So, I ordered more. A lot more. At least I thought it was a lot more. That was last Thursday. The re-order is supposed to arrive around May 12th. Now, let's fast forward to present... remember that additional large order placed last week... yeah... I'm currently down to about 130 patches available out of that shipment. Again... astonished. For right now, I have patches available and the website will be updated if they sell out. My advice would be... if you want them, get them... like NOW. I do have my 2nd patch program launching next week. You heard it here first! So, if you want to know about that... join the Newsletter list on BCGPatches.com or stalk this blog. i have to give all the credit for this to my husband! He contacted the owner of a local jewelry store and set up a field trip for our troop. They have 2 professional jewelry designers that make custom jewelry and repair. They showed the girls how a custom piece is made and explained the various tools they use. Each of the girls received a jeweler's loop, too. It was a great field trip! Okay... so we did work with metal tape for another project, but this is where you look back at what you did and think "hmmmm... yeah... that didn't really fulfill the requirement." But, it's 4 years down the road and I'm not in the business of repossessing badges. Ha! I ordered little glass bottle from Oriental Trading and we used memory wire (that's metal... woo hoo!!) to make necklaces. The girls wrote on a piece of paper something they don't ever want to lose about themselves... such as "I am funny" or "I like that I read books for fun. ", etc. They rolled that up and put it in the bottle. Then they strung beads onto the wire and we finished it off with a jump ring and lobster clasp. Before the meeting I took t-shirts and ripped them into 1" strips... leaving the strip a loop... so lay the tshirt flat and cut on the side and rip all the way around for a great big (or small, depending on the size of the shirt) loop. Then, the sleeves, cut open and cut into 1" strips. To form into bracelets, have the girls twist the big loops to form 4-5 small loops that would fit onto their wrist. 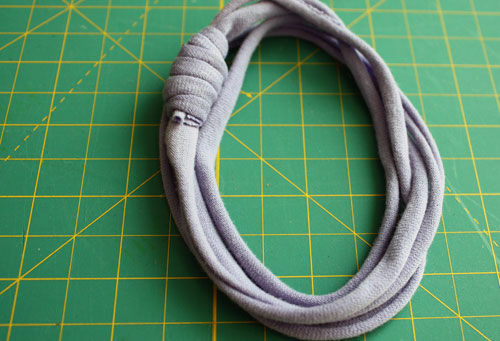 Use a sleeve strip and wrap around the loops to hold them together and tie the ends into a knot. Voila! no sew bracelet! UPDATE: Additional post here all about this! We did some research on ancient Egypt, because the girls were into that. We found a hieroglyphics chart (there's one here: http://edhelper.com/themes/Hieroglyphics_Chart.htm) and the girls wrote their name in hieroglyphics. Then, we used slides and metal tape purchased from Oriental trading to make slide pins they could put on their backpack or wear or whatever. Lastly, the girls all threw their name in a hat and drew out someone else's name... they talked to one another to figure out a favorite color and interests... I took in the big ol' bag of SWAPs supplies and the girls worked to create a SWAP using the information they gathered. I also had tissue paper and note cards. They wrapped their gift and wrote a note stating something they admired about the girl they made the SWAP for. I was a "mean leader" and told them whatever they admired could not be a physical trait. I hope some of this information helps sparks an idea for you when completing the Jeweler badges with your troop. much as I do, otherwise you may hear a Leader weeping uncontrollably. For Rose, there are 3 parts. 1. Read the story - easy, peasy! We made Fairy Gardens!! Each girl made one and took it home with her... what all do you need, you ask? Oh... let me help you with that! 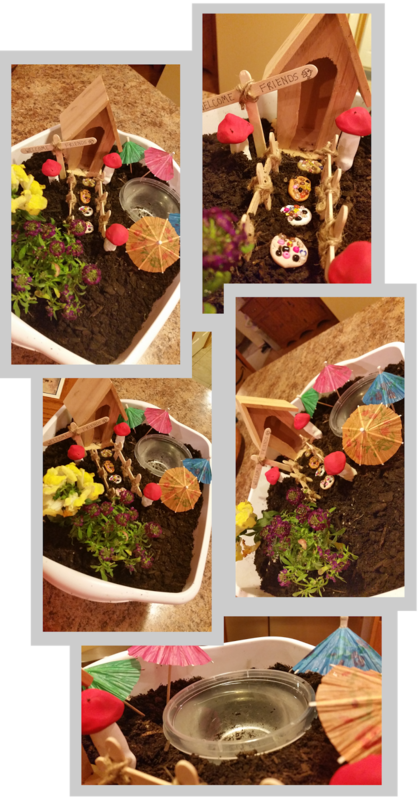 Fill the dishpan about 3/4 of the way with potting soil. Push in the other decorations. Find a sunny location (or shady depending on the flowers you purchased) and wait for your fairy to arrive. I'm sure she is going to LOVE her miniature world created just for her. So, how do you tie this in with the petal.... you have a discussion about the world. You talk about how plants help the environment and us, because they give off oxygen. You talk about how we each affect the world with the attitudes we give off. You talk about how the world is what you make it. There will always be bad things that happen in the world, but we each have the power to change it. We create the world in which we live... just as we have created a world for our fairy to live. We took great care to make sure the fairy is happy and we should put in even more effort into our real world and making sure the people we come into contact with are happy and cared for, as well. 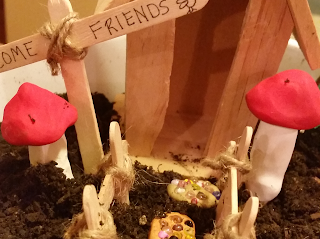 It's cool when fairy gardens teach life lessons, huh? 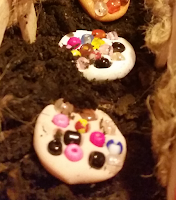 Sculpey clay and seed beads. Pinch off and soften a grape sized amount of clay. Roll into a ball, then flatten to disc shape. Pour seed beads into a bowl. Press clay disc into the beads to press them into the clay. Form white or ivory clay around the chopstick covering about 3"-4" of the wooden chopstick. Roll large grape sized piece of red clay into sphere. Then flatten one side, while forming the rest into the toadstool shaped top. Press onto end of chopstick. Bake 30 minutes in 275 degree oven. Using a popsicle stick as the horizontal "board", fasten the other three to it by tying it in a "x" pattern and knotting the ends together. Do this another time and you have 2 sections of fencing... one for each side of the walk, as seen in the photos. Using the same X pattern for tying, secure the two popsicle sticks together. 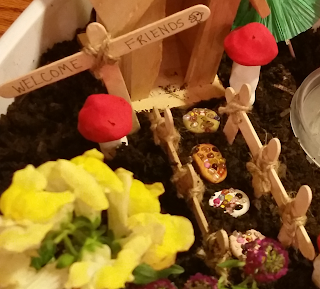 You can use a fine line sharpie to write "Welcome Friends" or whatever you want to greet in your fairy garden.